The saga of the move continues. At this point, it really is amusing to us. Not to mention, we are definitely chalking it up as a “learning experience”. My husband and I both discussed the fact had this happened 10 years ago, we would be completely unglued. It would be UGLY. Thankfully, we’ve both matured a little in the past 10 years-maybe not matured, but we’ve grown, learned a thing or two and had to face some harsh realities about ourselves-be willing to let God prune. It’s not been easy. Some days I wonder if I will ever change, be that person God has called me to be. It’s easy in the largeness of life to lose sight-to feel overwhelmed and defeated, to think I will never learn, things will never change… But in the stillness, in the small moments, when I quit striving and just take one more step in obedience I realize the good, the growth, the changes, the life worth living. We are about to enter phase two of the move-the move from one furnished apartment to another, at a completely different complex up the road about 5 miles. Not of our own doing or wishes. Nope. Someone, yet to be determined, made a mistake. We then, get to move. I have to tell you though, these past three weeks in the current small, two bedroom apartment have gone by rather quickly and we have sort of gotten in a groove. I am proud to say, we are quite organized as well, and have yet to have any sort of meltdown based upon not knowing where something is. Mind you, I did not say we have yet to have any meltdowns. I did say we have twin 15 year old daughters on this adventure with us, right? For them we have ruined their life, their summer fun, etc… Forget they are moving into a new home, with separate bathrooms and a pool. It’s all about immediate gratification at 15. In all seriousness though, they have managed really well. Despite an early meltdown or two, they have pitched right in, failed to complain and really are making the best of it. Some days they’ve done better than I have. I’m proud of them. If you have followed my blog at all, or know me, you know I am all about “containment”. I believe in and live by, “Everything in its place, and a place for everything.” I’d go insane if I had to manage my home any other way. As we have traversed this move (because yes it feels like an obstacle course), I have realized one of our saving graces has been my obsession with containment-which includes containers. Yep. I’ve got ’em and I love ’em. And yep, my husband rolls his eyes and friends love to chide me about them. That’s O.K. They work! Containers, used to contain specific, like objects work! They have made our move easier. 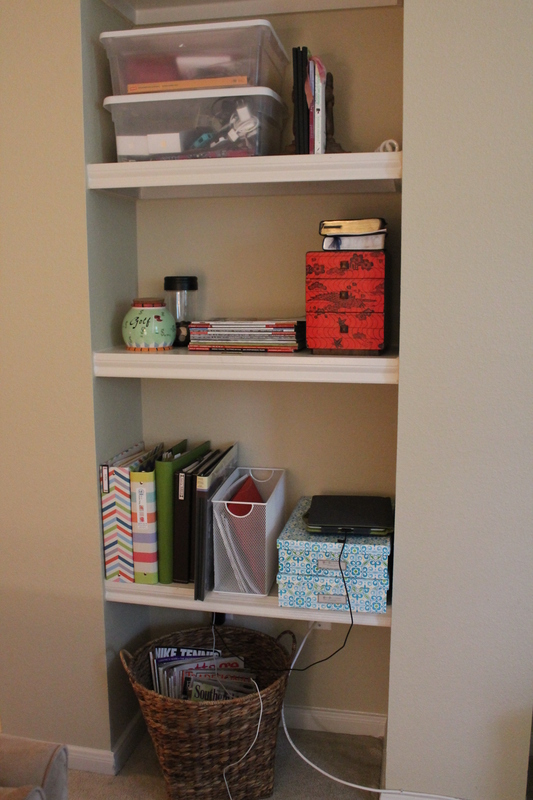 They have enabled us to continue with school, home school, personally owned businesses, volunteer work etc… I thought I’d share a few shots of our current apartment. Next week I’ll share some of the new apartment we will reside in for 45 days until the BIG move, which hopefully brings an end to this move as a whole. 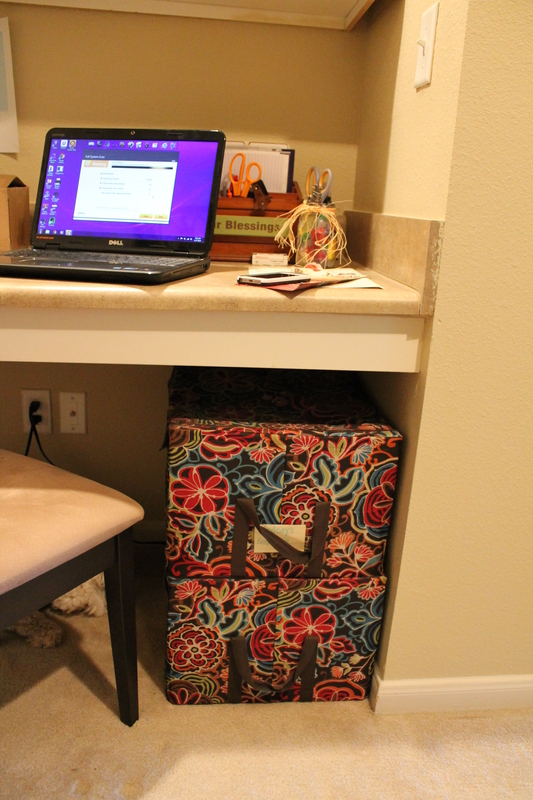 The apartment came with a nice little built in desk area, complete with cabinets above. 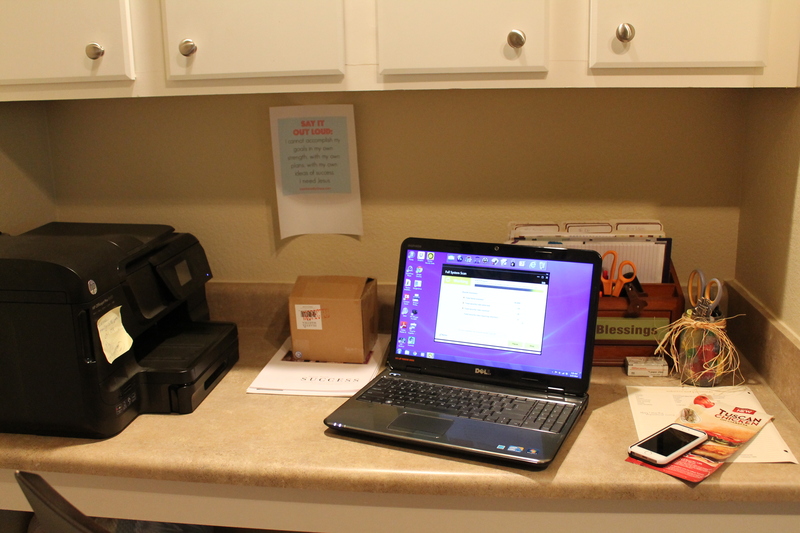 We have been able to set up office nicely, complete with wireless printer, laptop and my “mommy central” box intact just as it was in our old home. (see previous post). May not seem like a big deal, but that little box carries all our current info and means if I have it with me, I have everything I need for the immediate-everything not carried in my planner. In the knee space below I have the girls keepsake boxes which include all their special mementos. Love these soft sided boxes from Container Store. On the wall behind the desk and round dining table, I have bins of clothes (we were having unseasonable cold weather here in AR until last week and couldn’t put away all our fall/winter stuff. Seriously you all, it was 40 degrees two weeks ago.) We are also at the end of school so these boxes hold uniforms and will hold the remainder once school ends TOMORROW!!!!!) 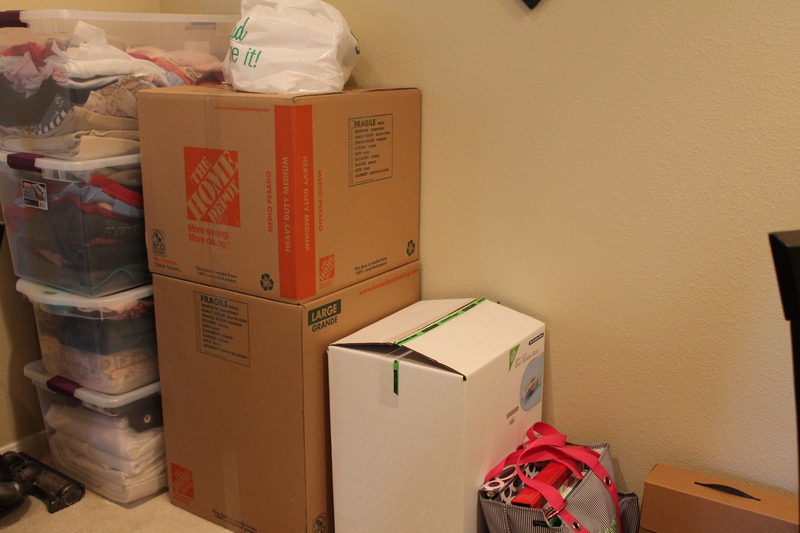 We have picked up a few items for the new house (life doesn’t stop) and so those items are packed in sturdy boxes. In the corner you see yet another great tote, this one by Thirty-One. It contains our home school supplies and planner. Then of course, my lazy susans. Oh how I love them. Y’all they are game changers! 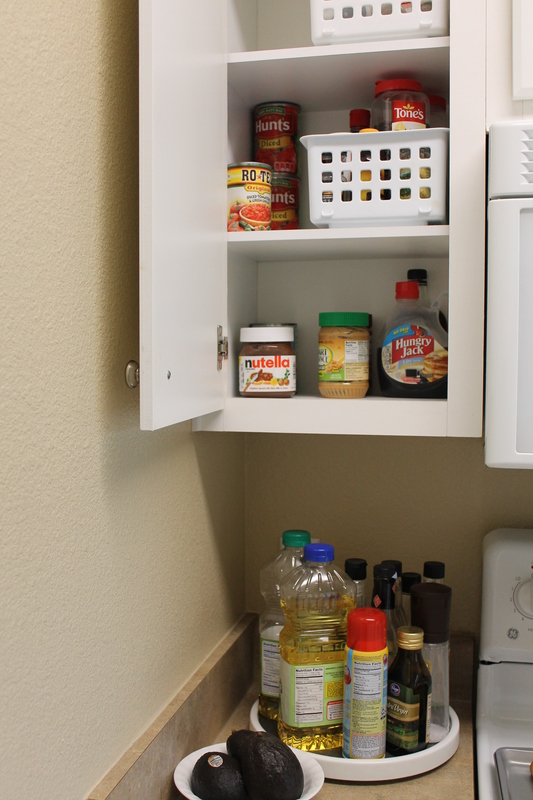 I was able to quickly set up my little cooking center putting all my oils and frequently used seasonings on a lazy susan next to the stove. My other items are neatly contained in white boxes (from Wal-Mart-I think they are Rubbermaid and sadly the design has been changed.) up in the cabinet. Loves these and had them in my old home-they fit standard depth kitchen cabinets perfectly. Same in bathroom. 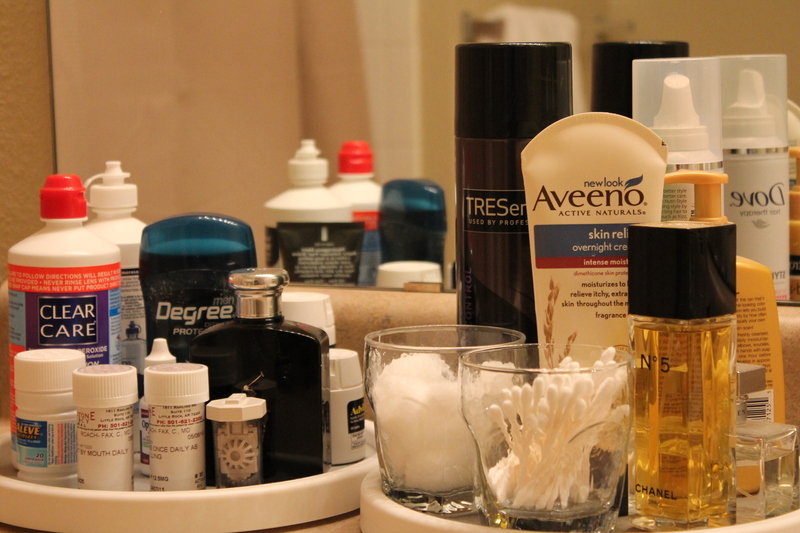 Apartment bathrooms are notorious for having limited counter or cabinet space. Why is this? Any way, ours proved to be no different. Solution? You bet. More lazy susans. Our daily supplies are neatly contained on these lazy susans leaving the remaining counter space for use. No frantic looking for items or fighting over drawer space. Apartment living or small space living isn’t perfect and it is most definitely not easy, especially if you are used to living in 2500+ square feet. But, it is doable, it is manageable. You need a few special items and I am telling you, the secret to it all is containers. We are living small right now, but it’s not keeping us from living large. We can still have dinner round the table. We can still laugh. Even as I write one of the girls is entertaining a friend. Business has carried on and to date, we’ve not missed a special moment in a friend or family member’s life. We are also learning we can live small. There are some good lessons in that too. We are reminded home is where we are as a unit. Home is what we make it. Home is not our stuff (which we acknowledge we have too much of), it is a sense of place we create.